57 Q. How does ‘the resurrection of the body’ comfort you? and made like Christ’s glorious body. 58 Q. How does the article concerning ‘life everlasting’ comfort you? a blessedness in which to praise God eternally. “Even my very flesh…will be reunited with my soul and made like Christ’s glorious body.” With its rather grim opening (“Transgression speaks to the wicked deep in his heart…”), Psalm 36 might tend to escape our notice as a song of the resurrection. But David’s confession of faith in the second half of this psalm is matchless; he knows in whom he lives, and moves, and has his being. “I already now experience in my heart the beginning of eternal joy.” As we Christians traverse life’s journey, our deliverance from death may not always be in the forefront of our minds. But along with saving faith comes this “beginning of eternal joy,” the knowledge that our future is secure with God. Psalm 118 gives beautiful voice to this hope. “After this life I will have perfect blessedness such as no eye has seen, no ear has heard, no man has ever imagined: a blessedness in which to praise God eternally.” Psalm 102 begins as a desolate lament, its very ascription identifying it as “a prayer of one afflicted, when he is faint and pours out his complaint before the Lord.” The psalmist cries out in v. 3 that his “days pass away like smoke,” and again in v. 11 that they are “like an evening shadow; I wither away like grass.” Then comes a turning point: “But you, O Lord, are enthroned forever; you are remembered throughout all generations.” Looking to his eternal Father, the psalmist rests assured that his life not just temporarily but eternally remains with God. For the helpless Thou dost care. Changeless Thou shalt live for aye. But Thy years shall ne’er be told. As I collected these powerful psalm settings, I was also reminded of a glorious old German chorale written by Philipp Nicolai back in 1599: “Wake, Awake, for Night is Flying,” number 371 in the Psalter Hymnal. Elaborating on the parable of the virgins in Matthew 25:1-13, it formed the basis for J. S. Bach’s famous cantata “Wachet auf,” an excerpt of which we know as the familiar piece “Sleepers, Awake.” You can enjoy the full cantata here. For now, though, I’ll leave you with the triumphant doxology of the third stanza. What comfort is ours through the resurrection of the body and the life everlasting! In bursts of choral melody. A handful of Reformed churches make the difficult decision to break away from their parent denomination. Troubled at the trends of increasing liberalism and waning orthodoxy among their fellow churches, they at length determine that their only option is to form a new body with the express purpose of remaining faithful to the Bible, the creeds, and the confessions. In many ways it is an exciting time for this new little group. They have the chance to root themselves firmly in the historic Reformed faith, to spread their branches into a functional and God-glorifying federation of churches, to bear the fruits of Biblical preaching, sacraments, and discipline, and to sow the seeds for a whole new generation of faithful Christians. But this period in the churches’ life is also filled with immense struggles, possibly the greatest they will face for decades. It is what some have aptly called “the crisis of youth.” Although the churches are united in their desire to remain faithful to Biblical orthodoxy, they differ in their origins, their ethnicities, their traditions, and even their theology. Individuals with identities emerge who, intentionally or unintentionally, lead their followers in slightly different directions. Debates develop and factions form over various aspects of doctrine, be they trivial or essential. Being composed entirely of human beings, they are all too prone to sin and stumble. But, striving to seek God’s will and to remain faithful to his Word, do they still comprise his church? Absolutely. The scenario I’ve just related is, of course, an historical one. You may already have in mind the founding of the United Reformed Churches in North America in the 1990s, and their life and growth over these past 17 years. However, the above account comes not from the history of the URCNA, but from a mildewy old hardcover entitled The Christian Reformed Church by Dr. Henry Beets. Those words represent Beets’s summarized account of the founding of the CRC in 1857. It is to Chapter 6 of his insightful work that we turn today. There, in 1857, stood the little group of churches—four of them, in fact, with only two ministers. In a few years there were only two churches and one minister. It would take many years for the Christian Reformed Church to build enough of a presence even to form a denomination proper. Along the way there were a host of impeding factors, some of which Beets comments on here. In the face of all these things, it is amazing to find the small group, whose fortunes we describe here, able to keep up its own church establishment, to keep the banner they had raised floating in the breeze, to march ahead in several respects, and try to realize the early ideals. The survival of the church is amazing, yes—but the work of our Lord is amazing too. Beets moves on to describe some of the early leaders of the CRC who, at the risk of alienating themselves from their family and fellow churchmen, stood for the truth and upheld the orthodox Reformed faith. 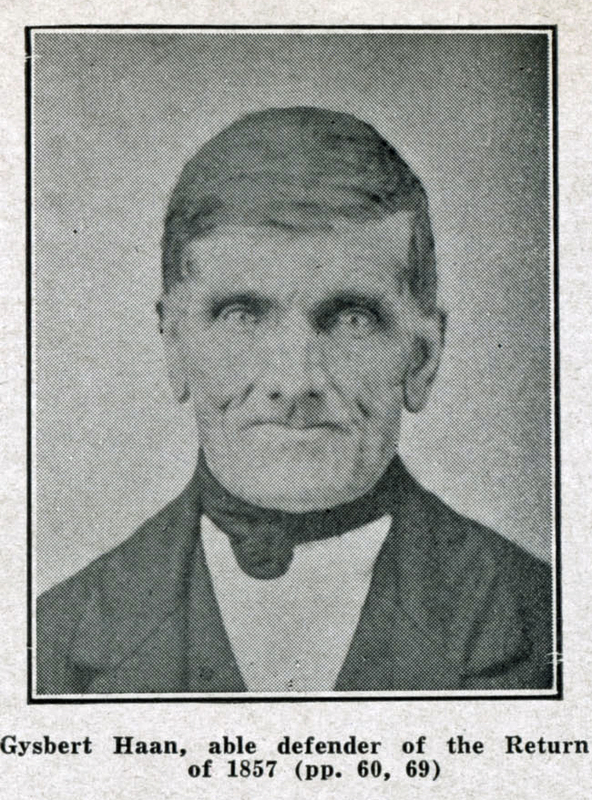 Among these was elder Gysbert Haan of Grand Rapids. “Slender, muscular, clean shaven, his hair whitened already early in life, with piercing eyes, with strong convictions and iron will power, an able debater, in calmness possessing his soul. 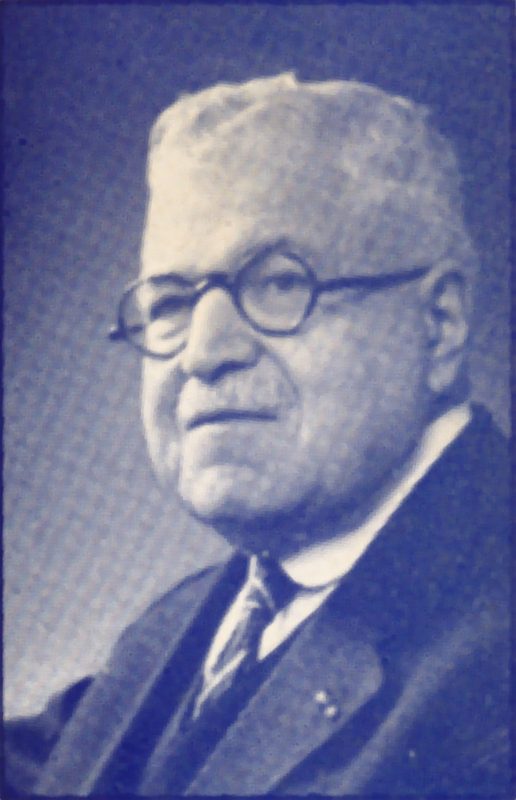 He was well posted on questions of church government and theology and was a born leader.” Haan fought vigilantly against the advances of Arminianism as set forth in Baxter’s Call, a work that was strongly defended by two church leaders who later confessed that they had not even thoroughly read the book. Beets praises him with all his faults as “one of our men of the hour. There would, humanly speaking, have been no Return in 1857 to the standpoint left in 1849, without Gysbert Haan.” Other important leaders included elders H. Dam and Y. Ulberg of Vriesland, J. Spykerman and P. Vanden Bosch of Noordeloos, J. F. Van Anrooy and A. Krabshuis of Graafschap, and A. Nysse of Grand Haven. The young Christian Reformed Church was troubled both by ridicule and condemnation from the outside (even being termed “the vilest district of modern Babylon” by Rev. Scholte of Pella), and disagreements and quarreling from within. At one time, 1863, in a moment of crisis, there was talk of discontinuance as a separate group. Merging with Old School Presbyterians was proposed by one leader. Then Johannes Groen of Vriesland was stirred up and delivered a speech that saved the day. Through it all, however, the CRC survived, and grew, and thrived, as Beets emphasizes, “to the praise of God alone…The banner was not only kept aloft, but carried forward.” By 1880 the denomination comprised four classes (Michigan, Illinois, Iowa, and Hudson), with a total of 12,001 souls. Yes, though with a scornful wonder men saw her sore oppressed, the Christian Reformed Church was richly blessed by God even in those first hard twenty years. Now, what of this narrative’s application to us today in the United Reformed Churches in North America? The parallels are striking. Both of our federations began as a relatively small group of churches seeking to remain faithful to God’s Word and the Reformed faith. 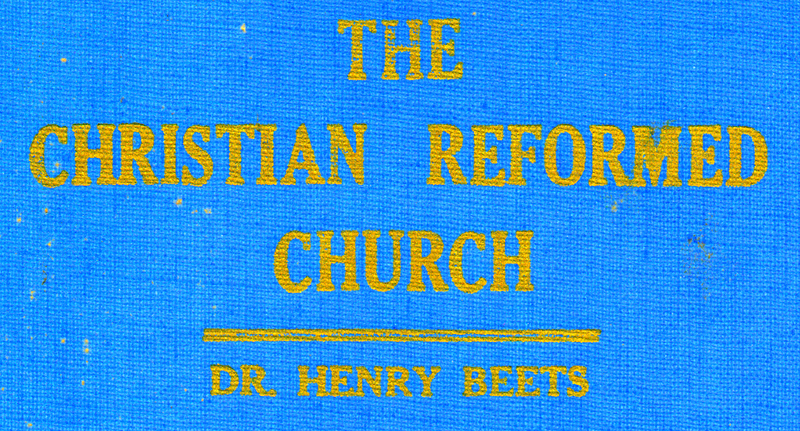 The CRC was 13 years old in 1880, the end of the period Beets describes here; our federation is about 17. Many of the specific challenges we face have remained the same as well. Although the URCNA has not made multi-ethnicity a hobby horse, as it has recently become in the CRC, one can still occasionally see misunderstandings and disagreements between our churches of Dutch origin and more recent congregations, much as Beets describes. There also seems to be a certain tension between some of the seminaries that supply our ministers. Our pastors, elders, and congregations have slightly different theologies and varying opinions even on the non-essentials, and worship practices (with psalm-singing high on the list) differ from church to church. Taken together, these obstacles can sometimes seem insurmountable. I’ll admit, lately I’ve experienced moments of despair about our weak collection of churches as well. He Himself will make thee strong.